We strive to be good ancestors. With stunning pictures and astounding mastery of scientific research and curiosities, Scott Chimileski and Roberto Kolter delivered an awe inspiring tour of the microbial world at the Long Now Boston Conversation on February 4, 02019. With stunning pictures and astounding mastery of scientific research and curiosities, Scott Chimileski and Roberto Kolter delivered an awe inspiring tour of the microbial world at the Long Now Boston Conversation on February 4, 02019. They provided a delicious smorgasbord of the wonders of the Microbial World, a world beyond the edge of sight, each wonder more astounding than the last. Well before the discovery of penicillin from the Penicillium notatum mold nearly a hundred years ago, tribes in South America had noted the antibiotic properties of leaf cutter ant pincers. When they used the pincers to stitch together wounds, the wounds healed better, yet they had no idea why. We now know that leaf cutter ants cultivate a fungus on the leaves they cut. The ants eat the fungus, which is their only food. But other microbes also thrive in the leaf fungus compost, some of which combat parasites and other microbes that would harm the ants. 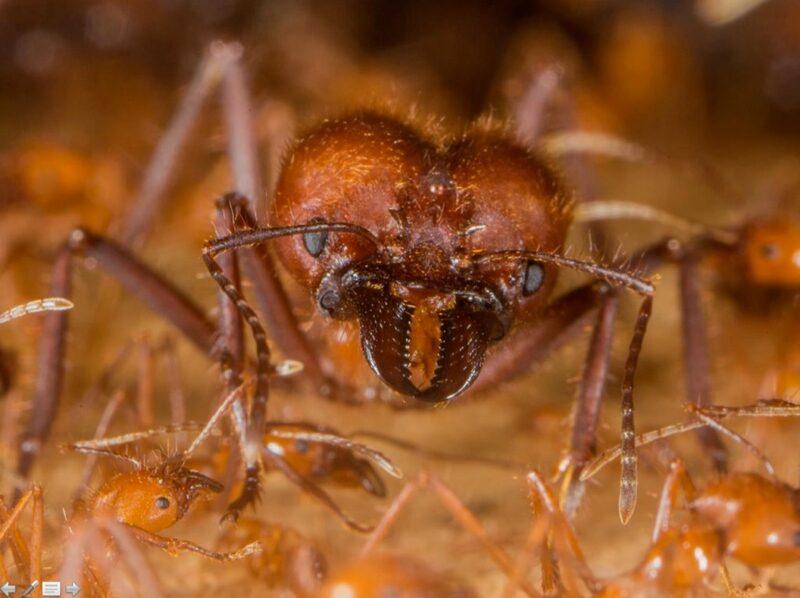 Being bathed in this complex symbiosis provides the ant pincers with the antibiotic properties of such value to the resourceful human populations that used them. It’s a bit frightening to realize that microbes evolve very quickly. Some bacteria reproduce by cell division every 20 minutes, which can yield a population of 2 million from a single bacterium in less than 7 hours. Significantly, every cell division is a chance for a change in the character of the microbe and in the types of molecules that it produces. Microbes are molecular factories that can produce substances of great help, or great harm, to humans. Fortunately, the great majority of microbes are beneficially symbiotic. Only a few are parasitic and destructive. 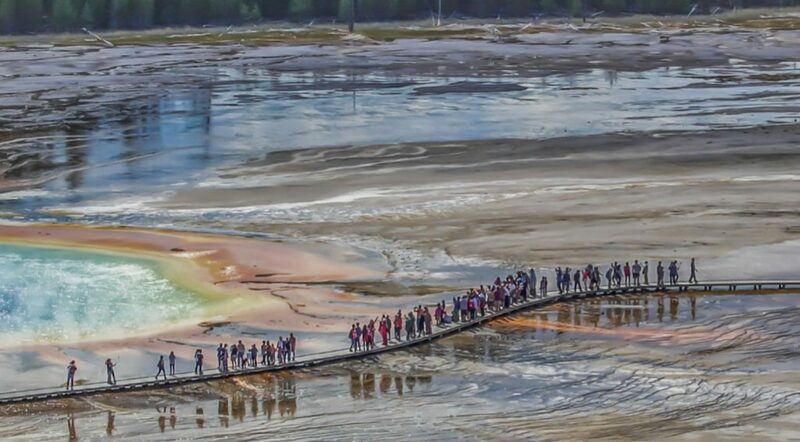 In Yellowstone National Park, the Grand Prismatic Spring is filled with boiling water heated by the Yellowstone volcano. In the boiling water of such vents, complex molecular fatty acids form by chance. At some point in the early history of the earth, these chemical reactions, the heat and the shear forces of the water created the condition for the first life – microbial life – to begin. In Yellowstone today, the cooling water around the hydrothermal vents is filled with mats of thermophilic microbes known as biofilms. They are the precursors to the more complex forms of life that came later. Antoni van Leeuwenkoek, a scientist, inventor and businessman, made an early magnifying lens to inspect the quality of woven cloth in the 1660’s. He also discovered the myriad of tiny animals that lived in pond water. No one before Antoni had seen things this small. It was a whole new world. He also looked at the chalk from the White Cliffs of Dover with his magnifying lens and noticed that it was made of small regular shaped particles, one on top of another. We now know that these Chalk Cliffs were made by microbes – the photosynthetic plankton that floated in the water. This plankton used the energy of the sun to sequester carbon in calcium carbonate, which became layered into the chalk cliffs, and release oxygen. Over geologic time, the sequestration of carbon and the release of oxygen fundamentally altered atmospheric chemistry. Without these microbes, the Earth would never have become an oxygen rich environment necessary for the evolution of higher animals and humans. Microbes are also at the heart of how soil is formed. There are 10 billion microbial cells in a single gram of garden soil. These microbes catalyze the break down of leaves and branches, releasing the simpler molecules that are then available for other organisms to use as nutrients and energy. Without the beneficial role of such microbes, plants would be unable to absorb these nutrients. Microbes also form large colonies within a complex extracellular matrix that each cell contributes to and benefits from. The extracellular matrix serves many functions such as the spatial organization that optimizes oxygen absorption for the individual cells. In such colonies, each microbe is still a single cell, but they somehow communicate with each other in building and modifying the extracellular matrix. Watching one of these colonies evolve and change makes it hard to see them as simply a collection of individual single cell microbes. Only a video can provide a clear picture of how amazing and elegant the colony growth is as it evolves. One of the more unique examples of sophisticated microbial behavior is found in the slime mold, Phsysarum polycephalum. In its active plasmodium phase, the organism expands immensely. Visible to the naked eye, it can grow to cover a square meter or more, and it can move in search of food! 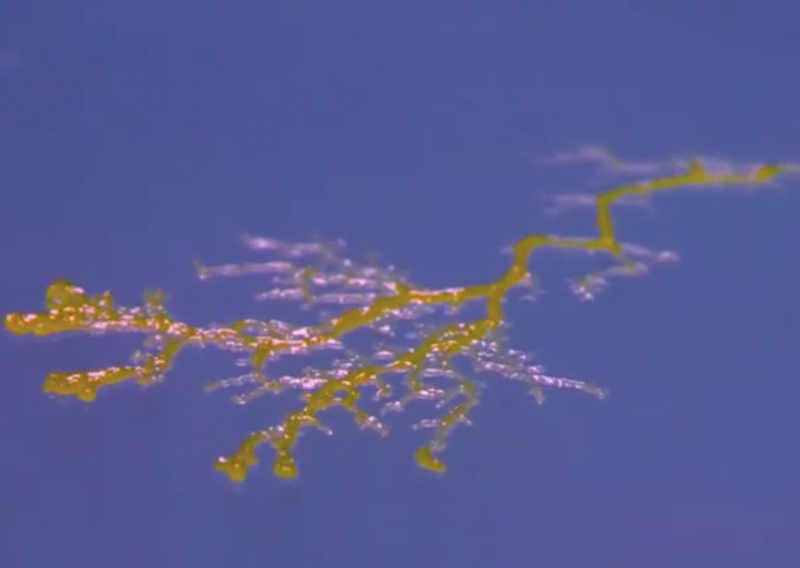 The apparent intelligence of a slime mold includes sensing where it has already searched by recognizing a translucent film left by its movement, and exhibiting sophisticated and mathematically efficient search patterns in its quest for food. 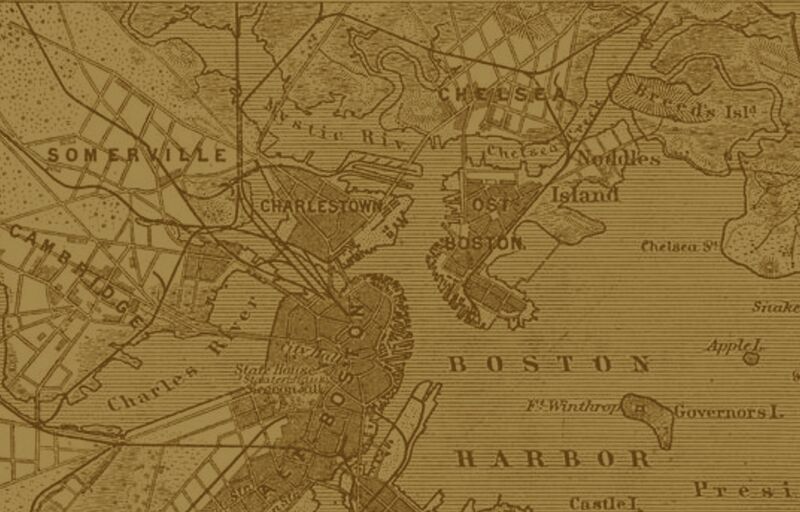 Scott’s photographs documented a remarkable fact: The patterns produced by the lowly slime mold are reminiscent of the patterns of roads and highways around Boston. 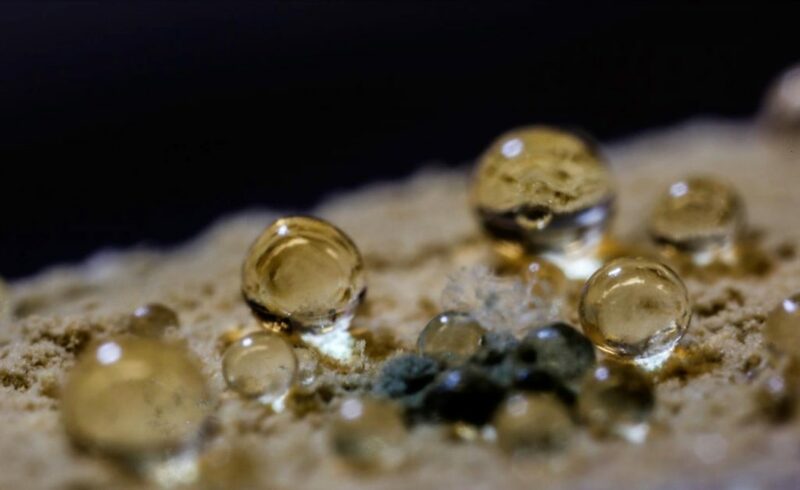 The individual and collective activities of the human inhabitants of a city seem to follow the same mathematical forms exhibited in the behaviors of the slime mold. Both exhibit the evolution of a complex organic structure, a sophisticated network interconnecting the parts within the whole. 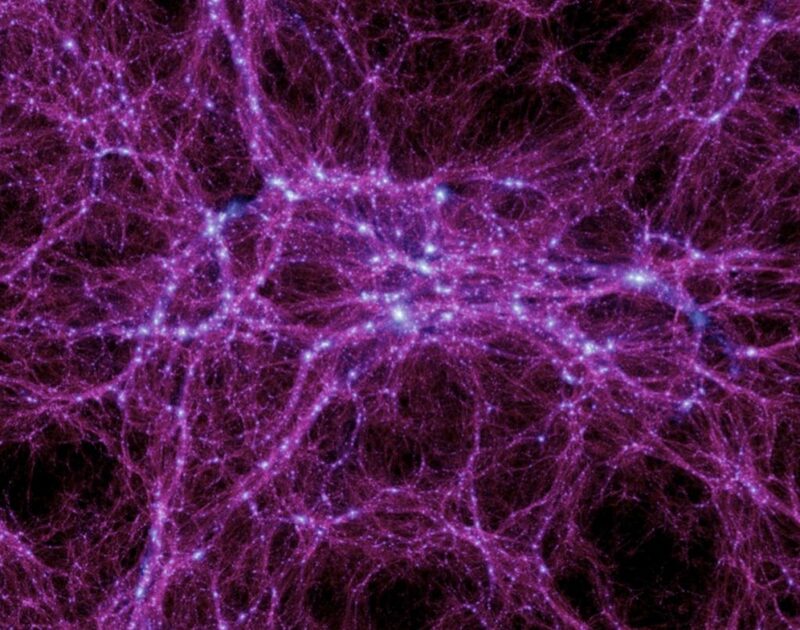 Astrophysicists have recently created images of the diffuse gas that extends across the entire universe, revealing a network structure now being called the “cosmic web.” The structure mirrors the theoretical distribution of the elusive dark matter. 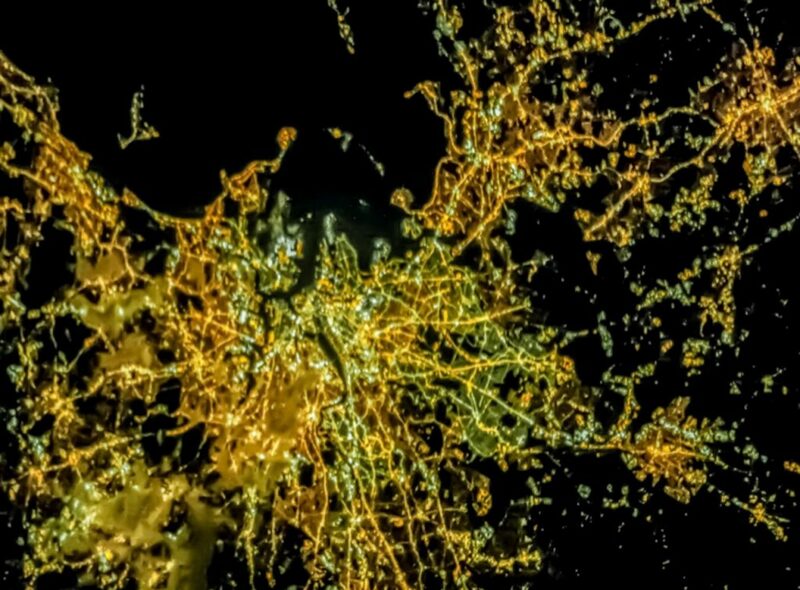 Perhaps more astonishing is the fact that it also exhibits the same complex organic structure as slime molds and human cities. Scott and Roberto concluded their presentation with a question: What are the forces, what is the explanation, for why the same patterns evolve across the physical cosmos, the microbial microcosmos and the cultural cosmos of human cities? Roberto Kolter is the Director of the Kolter Lab for Microbiology and Immunology at the Harvard Medical School. More than 120 individuals have trained in his laboratory during his 35-year tenure, most of whom followed careers in science in both academic and industry settings. Research in the Kolter Lab has always gravitated around the study of microbes and the exploration of a large number of different subjects ranging from basic bacterial physiology to bioactive compound discovery. Roberto is an author, Professor Emeritus of microbiology at Harvard Medical School and past president of the American Society for Microbiology. Robert joined Harvard Medical School in 1983 and has been Co-director of Harvard’s university-wide Microbial Sciences Initiative since 2003. In 2016, Kolter became co-blogger (with Moselio Schaechter) of the popular microbiology blog, Small Things Considered. Scott Chimileskiis a photographer and microbiologist serving as a Research Fellow at the Kolter Lab for Microbiology and Immunology at the Harvard Medical School. His work is currently being featured at the Harvard Museum of Natural History in the Exhibit on Microbial Life: A Universe at the Edge of Sight. Scott also coauthored, with Professor Roberto Kolter, Life at the Edge of Sight: A Photographic Exploration of the Microbial World(September 2017). Scott’s images have been published by WIRED, TIME, The Atlantic, STAT, The Scientist, NPR, Natural History Magazine, Scientific American, Smithsonian Magazine, Fast Company, and many other outlets. He received a Passion in Science Award from New England Biolabs in 2016 and was a winner of FASEB’s BioArt competition in 2016 and 2017. Scott earned his PhD in Genetics and Genomics from the University of Connecticut. Our next event, Decoding, Leveraging and Protecting Our DNA in The Age of Personal Genomics, with Preston Estep and Dennis Grishin, will be held at CIC on Monday February 4, 2019. Tickets are available on Eventbrite.